Why A Handbook for Prisoners With Diabetes? Prisoner Diabetes Handbook: A Guide to Managing Diabetes - for Prisoners, by Prisoners explains the facts about diabetes and how prisoners can help themselves when they have diabetes. Need to include name, address, prison ID. It is common, chronic, and can cause disabling complications. What you do for yourself to take care of your diabetes is the most important factor in your diabetes being well controlled. Very little diabetes education is provided in prisons. There are few organized programs for prisoners with diabetes. Experience has shown that others with diabetes are a good source of information about the disease. By cooperating and sharing, diabetics can help each other. A diabetes support group has been meeting at Great Meadow Correctional Facility in Comstock, New York since 1997. This group helps prisoners with diabetes to improve their diabetes management. People in the group learn from the experiences of other prisoners with diabetes. There is a lot of support and good fellowship in the diabetes group. Sometimes the group chooses a project to do together. In the fall of 2003 we decided to write a handbook to share what we learned about diabetes self-care in prison. This handbook is by prisoners, for prisoners. Our goal is to help you manage your diabetes better yourself. Diabetes is not just one disease but several different diseases that all cause the same basic problem: too much sugar in the blood. The sugar in the blood is called glucose. All cells in the body use glucose to make energy to live. All sugars and starches we eat are made into glucose. Glucose moves around the body in the blood to get to the cells where it is used. Insulin is a hormone that helps move glucose out of the blood into the cells. 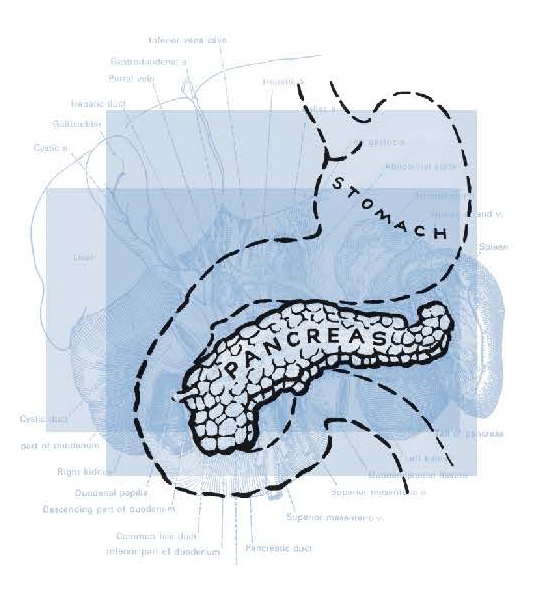 Insulin is made in the pancreas, an organ located behind and below the stomach. Someone with type 1 diabetes must always take insulin because his/her pancreas makes no insulin at all. People are usually young when they get type 1 diabetes, often under 20 years of age, but it can begin at any age. One out of ten people with diabetes has type 1 diabetes. The pancreas makes too little insulin and the insulin doesn’t work well. People are usually middle aged when type 2 starts, but it can begin in adolescence. Often many people in the same family have type 2 diabetes. Type 2 diabetes often occurs in people who are overweight and losing even 10-20 pounds will really improve the diabetes. Getting weight down to normal (especially early in the disease) may even cure type 2 diabetes for a while. More women than men have type 2 diabetes. Type 2 is more common among Blacks, Native Americans and Latinos. Nine out of ten people with diabetes have type 2 diabetes. Many people don’t know they have type 2 diabetes, because they don’t feel sick and haven’t had a blood sugar test. This type of diabetes occurs during pregnancy in a woman who did not have diabetes before. In gestational diabetes, the pancreas makes insulin normally but the insulin does not work well in the pregnant woman’s body. Gestational diabetes usually goes away when the baby is born, but it means that the woman is more likely to get type 2 diabetes later in life. Which type of diabetes do you have? If you’re not sure, ask the doctor. Over years, the high blood sugar of poorly managed diabetes damages the body in many ways. There can be damage to eyes, kidneys, nerves and arteries causing blindness, kidney failure, foot infections, heart attack, stroke, leg cramps, pneumonia, gum disease and other complications. Keeping blood sugar at near normal levels helps prevent the long-term complications like blindness, kidney failure, foot amputations, heart attacks and strokes. You cannot tell how good your blood sugar control is just by how you feel. Feeling good and not peeing a lot is not good enough control to prevent the long-term complications of diabetes. And if your blood sugar is often high, you may get used to high blood sugars and feel fine, even though the sugar is hurting your body. 1. Blood sugar tested before a meal is a measure of daily control and should be between 80 and 130 most of the time. What is your A-1-C? If you’re not sure, ask the doctor. Many people who have type 2 diabetes don’t know they have it. They don’t feel sick and may never have had a blood sugar test. Know who is at risk for diabetes. If you are at risk, get a blood sugar test. Tell others so they can get tested too. Urinating a lot, especially after eating sweets or a big meal. Feeling tired and not having much energy. Having numb or tingling feet. A fasting blood sugar test is used to diagnose diabetes. When was your last blood sugar test? What was the result? Were you fasting (nothing to eat or drink for at least 8 hours) when the blood was drawn? A fasting blood sugar of 126 or higher indicates someone who probably has diabetes. A fasting blood sugar between 100 and 125 indicates someone who may be developing diabetes. A fasting blood sugar under 100 is normal. If the fasting blood sugar is 100 or higher, it should be repeated. Tell people at risk to get their blood sugar tested. Tell people about the symptoms. Diabetes can destroy your health slowly while you do your time. But ignoring diabetes is dangerous. So get diagnosed, learn to control your blood sugar, and stay healthy. Some prisoners survive well in prison by living a highly disciplined life. People with diabetes need to be disciplined too and manage their blood sugar with knowledge, self-control and medicine. A person who has diabetes needs to be disciplined in order to be able to follow consistent daily routines. This is truer in prison than outside, since choices in prison are limited. Healthy eating, especially in prison, requires self-control. Self-control is a necessity that people who manage diabetes successfully get comfortable with. You need a daily schedule because following a daily routine is one way people live well with diabetes and achieve good blood sugar control. Regular meal times and regular physical activity help control blood sugars. 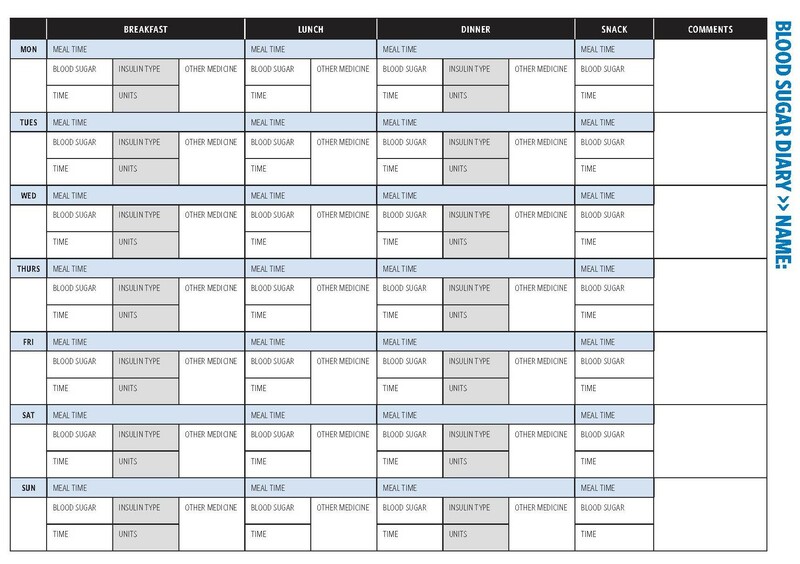 Daily routines in prison are well established and consistent so the rigid structure of the correctional day can support your efforts to follow a regular daily activity plan. Diabetes is with you all day every day. Find the right balance for you. Remember, good blood sugar control prevents complications of diabetes such as blindness, amputations, kidney failure, heart attacks and strokes. How you feel affects your diabetes plus how you feel influences what you are able to do for yourself. You need mental strength to manage diabetes in prison day after day. In prison, it’s hard to relax and hard to feel safe, even locked in a single cell. Stress affects everything about daily life in prison. Stress affects your diabetes control physically and emotionally. You’re never alone, yet always being with strangers is often lonely. You’re disconnected from family, friends, and home. When the letter you are waiting for doesn’t come, when packages and visits stop, you can feel alone and hopeless. Sometimes people get frustrated and upset about diabetes or frustrated with other people’s responses. It is frustrating when sugar stays high even though you have tried to improve it. It is frustrating to feel like a freak and be ashamed and fed up with the needles. Stress and frustration can cause you to lose focus and your self-control. Hopelessness affects your will power and discipline. You may go back to old eating habits, stop testing, skip medicine, or miss healthcare appointments. Exercise and music help the body and mind to relax. Change conditions to reduce stress; find where there is less noise and fewer threats. Quiet is better. 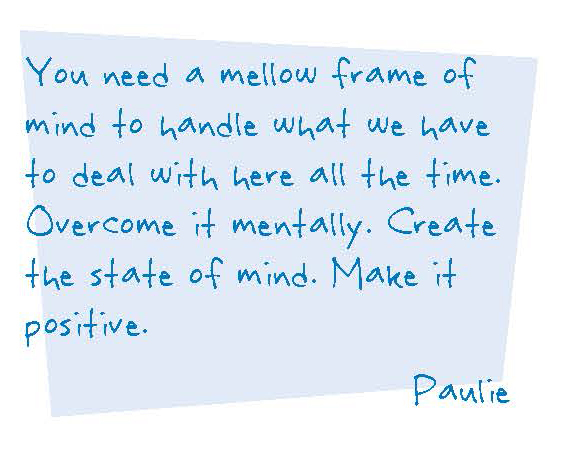 You need a chance to get into yourself to relax. One person in our diabetes group learned meditation from a Buddhist volunteer in another prison. Diabetes needs your attention every day. Successful management is finding the right balance of diet, activity and medicine to control blood sugar and keep your A-1-C under 7%. Nurses and doctors who care can help you to improve your diabetes management. They can give you advice about diabetes and can adjust your medicines to improve control. They can give you access to things you need like blood sugar tests, the medical diet, and specialist referrals. But you have to convince them to work with you so you can get what you need. You may have to show them that you are serious about your diabetes. 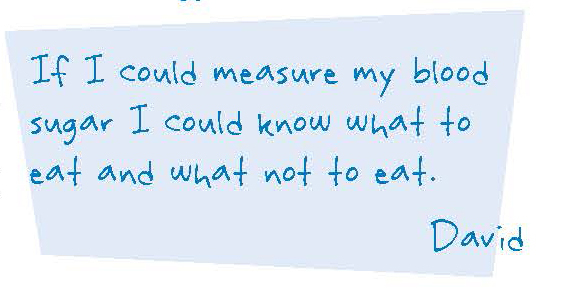 There is only limited variety and quality of foods available in prison and access to blood sugar testing is limited. There is also limited availability of important services like diabetes education, medical nutrition therapy, podiatric care, and dental hygiene. Insulin is rarely given more than twice a day and the timing may not be the best. Plus some medicines and devices, such as insulin pumps, are not available. You can’t “shop” for professionals you trust. Furthermore, it’s hard to get to the specialty appointments you need or hard to do what you have to in order to get to those appointments. You need to set your own diabetes goals and work to achieve them. You can’t get the A-1-C from 13% to under 7% instantly. It takes time and effort. Goals for today might be: avoid candy; eat more fruit. Goals for the next 3 months might be: lower your A-1-C from 13 to 11. Goals for life might be: no amputation, no kidney failure, no blindness. Begin with what is most important to you, today, right now. Improve your diabetes management starting there. If someone says, “You’re dumb and you’re doing it all wrong,” that doesn’t help you at all. But when someone says, “Let me tell you how I do it so you can do it better,” that supports your own best efforts. Success helps too. When you see the positive results that your self-discipline can achieve, it gives you strength to go on. Lower blood sugar tests, lower A-1-C, fewer low blood sugar episodes, or weight loss are good measures of success. Learning what to do creates confidence. Knowledge helps you establish control. How does a prisoner learn about diabetes? Family: Talk to your family about your diabetes. Your mother and your sister may know a lot about diabetes. Others with diabetes: Talk to others who have diabetes when you are in clinic together to get insulin shots or at meals together. Professionals: Ask nurses or doctors about diabetes. Find out who has a special interest in helping people with diabetes. Read: Find pamphlets, books, and magazines to read about diabetes. Look in the prison library for health books. Write: Diabetes organizations will send you information if you write to them and ask for publications. Diabetes Forecast: published by the American Diabetes Association, PO Box 363, Mount Morris, IL 61054-8303. Diabetes Health: published by King’s Publishing, PO Box 15368, N. Hollywood, CA 91615-5368. Centers for Disease Control and Prevention, Take Charge of Your Diabetes, 3rd edition, Atlanta: U.S. Department of Health and Human Services, 2002. (FREE). This and other materials are available by calling 1-800-232-4636, option 4. People with diabetes can educate each other. 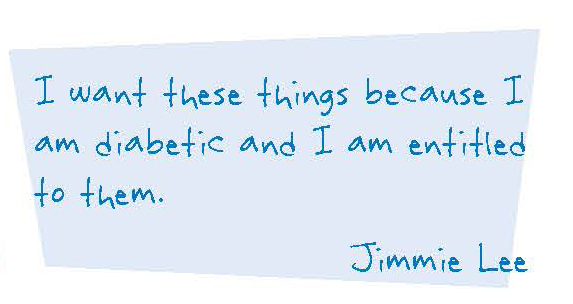 In a support group, people with diabetes share their experience and knowledge. Ask the health staff at your prison to sponsor a diabetes support group. Choosing what to eat may be one of the last freedoms a prisoner has left. 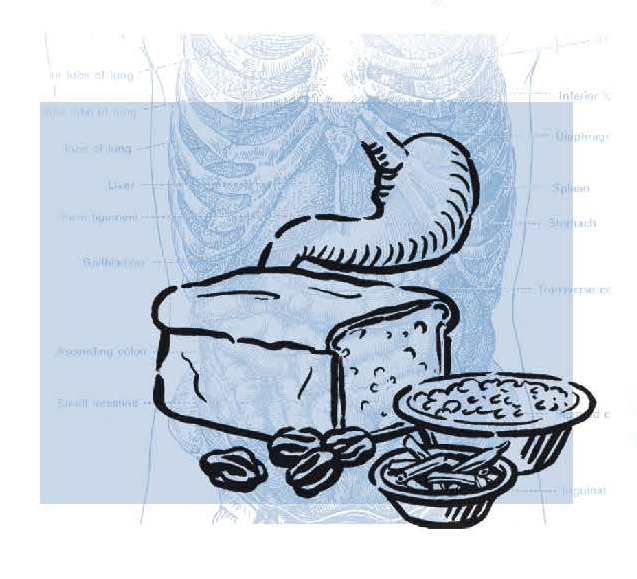 The restrictions of a medical diet can be hard for people who are locked up. 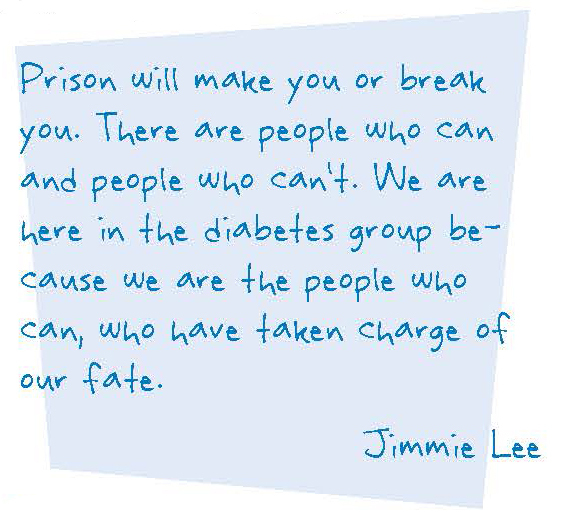 A prisoner with diabetes may resist letting diabetes take away his last freedom. 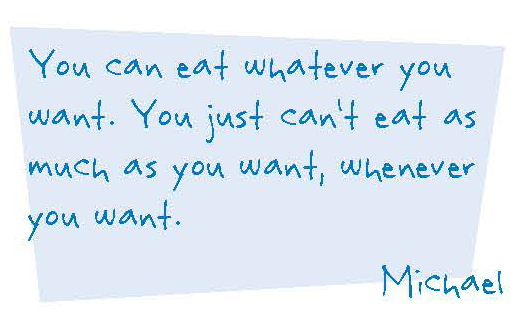 But having diabetes doesn’t mean you can’t have your favorite foods. Knowledge about food and nutrition will help you to choose wisely. Be strictly disciplined if you want, or be self-indulgent in an intelligent way if that is what you want. Eat less fat, especially animal fat, to reduce the risk of heart attack and stroke. Eat less salt and sodium to help control blood pressure. Eat fewer total calories for weight loss if you are overweight. There is no “diabetic diet” and there are no “forbidden” foods. If you are on medicines that lower blood sugar (like insulin and sulfonylureas), you should eat consistent amounts of starch and sugar (carbohydrate) at each meal or snack. If you control your diabetes with exercise and diet, or if you are on medicines that don’t lower the blood sugar, avoid eating a large amount of carbohydrate at one time. In other words, spread your carbohydrates throughout the day. BUT, many people with diabetes find it is easier to reach their blood sugar goals when they stop drinking regular soda and large amounts of fruit juice and stop eating candy and other foods that are almost entirely sugar. There are medical nutrition goals based on each person’s needs, such as carbohydrate controlled meals, reduced fat and cholesterol, reduced salt, high fiber, or weight loss. You should think about what you eat, and choose foods that support your goals. Why low saturated fat and low cholesterol diets? Animal fat is mostly saturated fat and cholesterol therefore eat less animal fat because a diet with less saturated fat and less cholesterol is healthier. A low saturated fat diet helps prevent heart attacks. A low saturated fat diet helps prevent strokes. A low fat diet has fewer calories to prevent weight gain. How do I eat a low saturated fat, low cholesterol diet? Eat fewer fatty foods like sausages, bacon, cheeseburgers and chips. Eat leaner meats like skinless chicken or turkey breast and fish, if available. Eat less high cholesterol foods like egg yolks and liver. Cream is an animal fat that contributes to heart disease and stroke. Because 1% milk or skim milk has less cream, it is better for you. Also, eat lower fat cheeses like part skim milk mozzarella, if available. Why a low salt diet? Salt is made of sodium chloride and contributes to high blood pressure. For a lower salt diet use little or no salt from the salt shaker on the table. Always rinse canned vegetables to remove some of the salt used in canning. Also limit salty snacks like chips and salted nuts. And, if you drink tomato or V8 juice, get the low salt kind. Read the nutrition labels on packaged foods purchased from the commissary. Labels tell you how much carbohydrate, saturated fat, cholesterol and salt are in each packaged food item. Many prisoners like to eat the whole package all at once. But, usually there are 2 or 3 “servings” per package. Figure out how much carbohydrate or saturated fat is in the whole package. One fruit pie has almost 500 calories. A whole fruit pie is not a good choice for a snack at night because it has too many carbohydrates. But an athlete who has diabetes might need a large snack like a whole fruit pie before and during an extremely strenuous workout to prevent his blood sugar from dropping too low. Choose healthy foods with less sugar, less fat, less salt, and more fiber. Eat fruit and vegetables, especially raw vegetables, whenever they are available. Try to be consistent about the amount of starch or sweet foods (carbohydrate) that you eat each day and at each meal or snack. If weight loss is your goal, eat smaller portions. Learn how to salvage an adequate diet from what they feed you, by choosing well and trading with others, if allowed, for more of what you need. If possible, spread food out throughout the day in meals and snacks. If you take medicine for diabetes, don’t miss a meal or planned snack. Eat enough carbohydrates to prevent low blood sugar when insulin is most active. Morning REGULAR insulin acts after breakfast and lasts through lunch. Morning NPH insulin acts after lunch and lasts through dinner. Evening REGULAR insulin acts after dinner and lasts until late evening. Evening NPH acts around midnight and lasts throughout the night. People who take insulin for diabetes may need 1 or 2 snacks to prevent low blood sugar. These snacks should be at the times when their insulin works the hardest, or just before they have been having the low blood sugar reactions. Low blood sugars in the middle of the night? Try a snack around 10PM. Blood sugar too high at 4PM? Eat less starch at lunch or skip that afternoon snack. Muscles use blood sugar for energy during exercise. So, before a major workout plan to eat a larger lunch with enough carbohydrate to prevent low blood sugar when exercising. Eat snacks with some carbohydrate during and after exercise. However, during times of inactivity, such as watching a movie, if you plan to eat candy, then eat a smaller meal. Most prisoners have little choice at mealtime. But, even if you get one tray, you can choose what to eat off the tray. Know what is in the food you eat. Use nutrition labels, common sense, or read books about food and nutrition to learn more. Remember to eat fewer sweets and fats and eat to satisfaction, but don’t overeat. Increase fiber by eating more fresh or raw fruits and vegetables, whole grains, beans, bran and oatmeal, when available. Try to substitute foods. For example, if you want syrup on that pancake? Use sugar free diet syrup. Or can’t get any diet syrup? Ok then, use a little sugar syrup, but eat fewer pancakes. Want a small piece of cake for dessert? It’s ok. Eat less starch (potato, bread, pasta, rice) with the meal to compensate for the sugar in the dessert. At first people in the diabetes group said, “3 bean salad is garbage all mixed up to hide what’s in it.” But it provides vegetables and fiber that you need in your diet. The recipe calls for 3 different beans to be mixed up together. Most of the men were unfamiliar with this type of salad, so they thought it was all leftovers. Now many of them eat 3 bean salad to improve their diet. 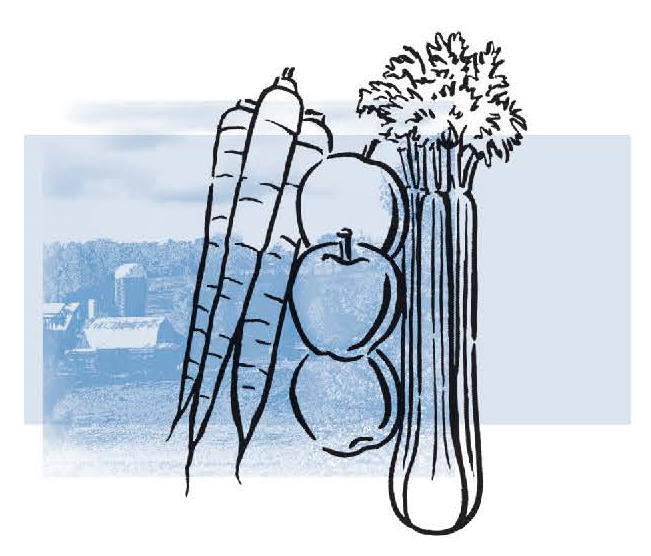 At first people in the diabetes group said, “The cole slaw is rotten and they’re covering it up with that thick dressing.” But it is one of the few sources of raw vegetables which is on the menu frequently. One man tried it and reported back that it was ok. Many of them now eat coleslaw as often as they can. But apples are the only fresh fruit that is regularly available on the menu. Make the most of it in spite of the monotony. Trade away high carbohydrate or high fat items in exchange for fruit, vegetables (especially raw vegetables) and high fiber foods. General diet: apples, cole slaw, three-bean salad, oatmeal, wheatena. Commissary: canned beans, canned vegetables, instant oatmeal, popcorn. People who take insulin may need a snack (especially before bed) to prevent low blood sugar. But not everyone who has diabetes needs to have snacks. If you are trying to lose weight, snacks may help or hurt your ability to lose weight. If it is allowed, you may need to stockpile food for evening and nighttime snacks. In some places, limited amounts of food may be carried out of the mess hall: one apple; 4 slices of bread. If you are able to, collect fruit when you can (apples; unripe bananas) and eat them as snacks over several days. But you can get a ticket for a rule violation if you take too much food out of the mess hall for snacks later. Choose an exercise program that is comfortable for you. Be alert to the risk of low blood sugar during, shortly after, and hours after a strenuous workout. Plan ahead how you will prevent low blood sugar during and after exercise. 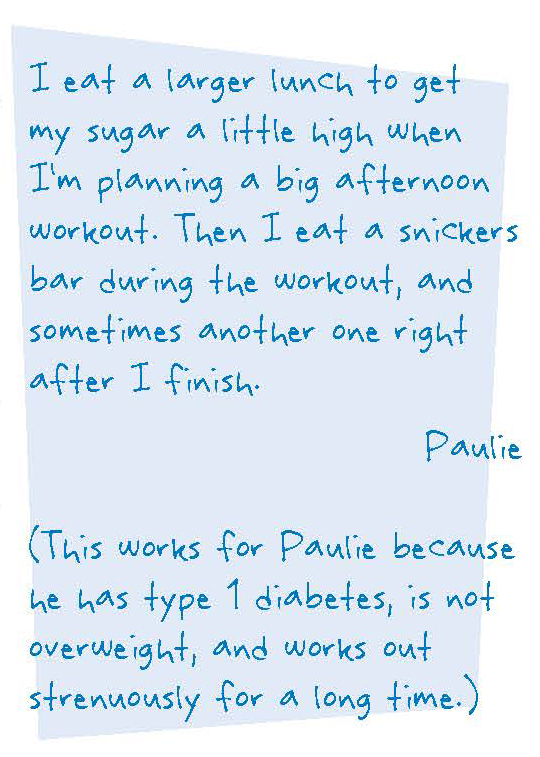 Eat more before and/or while exercising and have some sugar with you. On the other hand, if your blood sugar is too high, exercise can bring it down to a better level. You can use exercise to correct high blood sugar. The yard can be dangerous, so exercise where you feel safe. Because access to the gym is limited, take advantage of a gym if you can. Learn ways to work out in your cell. 1. Push-ups on the floor. 2. Sit-ups: Wrap a belt around the end of the bed loosely, lock feet through the belt to hold legs down, then do sit-ups. 3. Pull-ups: Use a towel to pull yourself up on the bars; or stand your bed straight up and pull yourself up. 4. Crunches can be done on the bed or on the floor. 5. Dips can be done by standing between the locker and the bed post, support your weight on your hands on the locker and bedpost, bend legs at the knee to move lower legs out of the way behind you, then do dips up and down with arms. 6. Do “dead weights” by using water filled buckets as weights, lifting in unison with both arms. 8. Do stretches by placing feet on bars. 10. Lunges: step forward and bend knee; repeat on opposite side. 11. “Cherry picking”: legs about 2 feet apart; arms reach up high, then down to shoulder level, then bend down to touch the toes, repeat. People who have type 2 diabetes may need to take one or more medicines to help control their blood sugar, in addition to being active & choosing healthy food. The longer a person has type 2 diabetes, the more effort (and medicine) it takes to control it. There are different kinds of diabetes pills that work in a variety of ways to help the body deal with these problems. There is no “best” pill or treatment for type 2 diabetes. You may need to take more than one type of pill or pills plus insulin. Medicines that help the pancreas make more insulin. These medicines are called sulfonylureas and include Glyburide (Diabeta, Micronase, Glynase Prestab) Glipizide (Glucotro1, Glucotrol XL) and Glimepiride (Amaryl). Possible side effects include low blood sugar, weight gain, upset stomach, skin rash, and itching. Other medicines (meglitinides) help the pancreas make more insulin, especially after meals. They are Repaglinide (Prandin) and Nateglinide (Starlix). Possible side effects are low blood sugar and weight gain. Medicine (biguanides) that slows down the amount of sugar made by the liver called Metformin (Glucophage, Riomet, Glucophage XR, Fortamet, Glumetza). Possible side effects include diarrhea, nausea, upset stomach, metallic taste in the mouth, and weight loss. Medicines that help your body use its own insulin better. These medicines (thiazolidinediones) are not used in people who have active liver disease or those who have had congestive heart failure. These medicines are Rosiglitazone (Avandia) and Pioglitazone (Actos). Possible side effects include liver problems, weight gain, and swelling of the feet and legs. These medicines take 2-4 weeks to begin to work when you start the medicine and to stop working when the medicine is stopped. Medicines that slow the digestion of carbohydrates (sugar and starches) in the small intestines are called alpha-glucosidase inhibitors. These include Acarbose (Precose) and Miglitol (Glyset). Side effects are common and include bloating, diarrhea, and gas. Because the medicines work in different ways to lower blood glucose, they are often used together. Some combination drugs are Glucovance, Avandamet, Metaglip and ActoPlus Met. Insulin is a hormone that lowers blood glucose by moving glucose from the bloodstream into the body’s cells. If you have type 2 diabetes you may need to start taking insulin based on several factors – how long you have had diabetes, how high your blood glucose levels are, what other medicines you take and your overall health. Taking insulin does not mean that you now have type 1 diabetes. Many people with type 2 diabetes need to take insulin sooner or later. Scientists are developing new medicines for diabetes all the time. In 2006, two new injectable medicines became available. The first is an “incretin memetic” called Exenatide (Byetta). It boosts insulin release when the blood glucose is high, prevents the body from releasing too much sugar from the liver, and slows emptying of the stomach after meals. It often leads to weight loss. The second is called Pramlintide (Symlin). This is a copy of a human hormone called amylin and is only used in combination with insulin. It slows stomach emptying, stops the liver from producing too much sugar, and stimulates feelings of “fullness” after eating. Insulin is ALWAYS used to treat type 1 diabetes. Pills are not useful or effective in type 1 diabetes. To treat type 1 diabetes, insulin may be given from 2-4 times a day. There are three characteristics of insulin – Onset (when the insulin starts to work), Peak (when the insulin is working the hardest) and Duration (how long the insulin works). 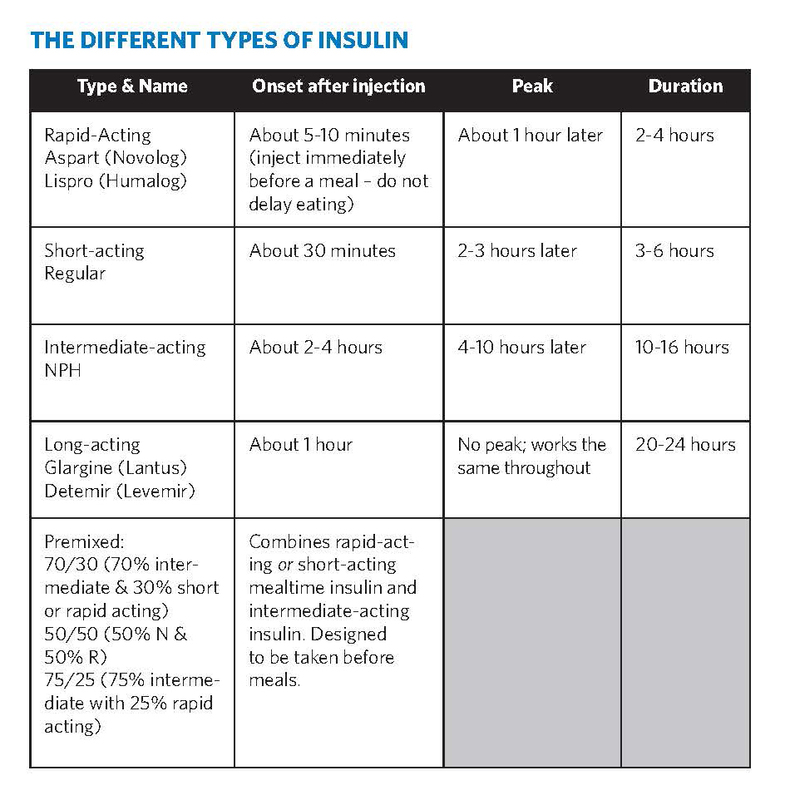 If you take rapid, short, or intermediate-acting insulin, you need to eat on time and match your meals (and possibly snacks) and your insulin injections. Your insulin should peak at the same time blood sugar levels from meals are also peaking. You may need extra insulin to lower your blood sugar if it is high. Pramlintide (Symlin) (see above) is also used, in combination with insulin in type 1 diabetes. Insulin can cause low blood sugar reactions. Insulin already injected can’t be stopped from working. If you take insulin, don’t skip meals. Some prisoners with diabetes want to give their own injections. However, there is no self-injection of insulin at some prisons. 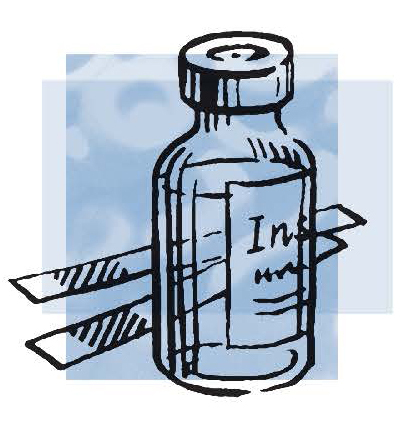 Choosing where to inject and how to inject is very personal. Sometimes nurses fill syringes before patients come in for their shot. Some prisoners with diabetes worry about the accuracy of the dose and type of insulin. They would prefer to draw up the dose themselves and inject themselves. If that’s not allowed, do what you can to make sure you are getting the right kind and amount of insulin. One man described how he didn’t want to have two insulin shots a day because he hated the needle. But, finally he agreed to try it. In less than two weeks, he was feeling a lot better in general, so he agreed to keep the two shots after that. Monitoring is what you do to assess how well you are managing your diabetes. There is the monitoring you do yourself, and there are other types of monitoring that doctors and nurses have to do for or with you. It helps you know when something has to change to get better blood sugar control. Blood sugar testing and the A-1-C test give you feedback about how you are doing with your diabetes management. If these tests are not as good as you want them to be, something needs to be changed in your management plan to improve control. Also, lab tests can identify complications of diabetes so they can be treated. Read your body’s signs and pay attention to what it is telling you. Learn to recognize your feelings associated with highs and lows. Any person who has diabetes can have high blood sugar. People treated with insulin and some pills can have low blood sugars. If your blood sugar is high, you might notice you have blurred vision, leg cramps, headache, fatigue, thirst, frequent urination. But your sugar may be too high even if you feel fine. You need to test your blood sugar regularly to see if it is “in target” or under 140 most of the time. You need to test your blood sugar more than once a day to fine tune sugar to the normal range. If your blood sugar is low, you might notice feeling shaky, sweaty, dizzy, confused, or aggressive. You might have nightmares, have a seizure, or go unconscious. The quickest way to raise your blood glucose is with some form of sugar, such as 3-5 glucose tablets, ½ cup of fruit juice or 5-7 pieces of hard candy or ½ cup of regular—not diet—soft drink . Keep a log of your blood sugar tests. 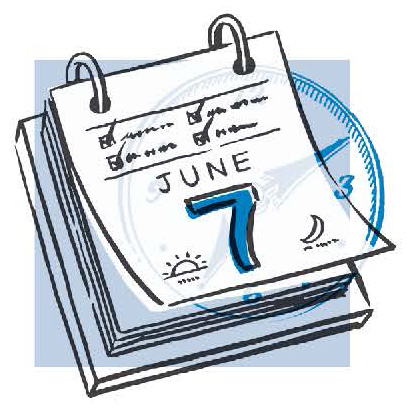 Include date, time, any unusual activities or meals over the last four hours before the test. Note changes from your usual routine on the log, such as extra exercise or missed meals, which may explain unexpected lows, or extra food or sweets you may have eaten that may explain an unexpected high blood sugar. Always low in the morning? Maybe you need a late night snack. Always high before dinner? Maybe you need more medicine. Unexpected low before dinner? Was there an extra hard workout that afternoon? Always high after pizza lunch? Eat fewer slices next time. Notice how much food makes your next sugar test too high. Learn how to eat from observing the effect of particular foods on the blood sugar. Eat less or eat something else the next time that meal is on the menu. 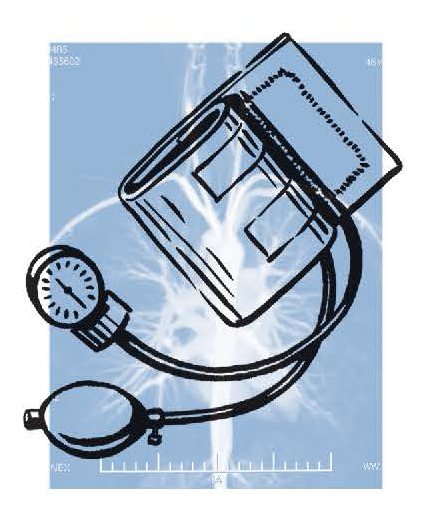 Doctors and nurses should do clinical assessments like blood pressure measurement to assess for hypertension (high blood pressure) and foot exams to assess for numbness, injury or infection. Doctors should order lab tests to monitor the effectiveness of blood sugar control. Lab tests to monitor blood sugar control include the A-1-C test every 3-6 months and fasting blood sugar tests. Other lab tests monitor for complications of diabetes. Blood lipids like cholesterol and triglycerides assess risk for heart attack and strokes. 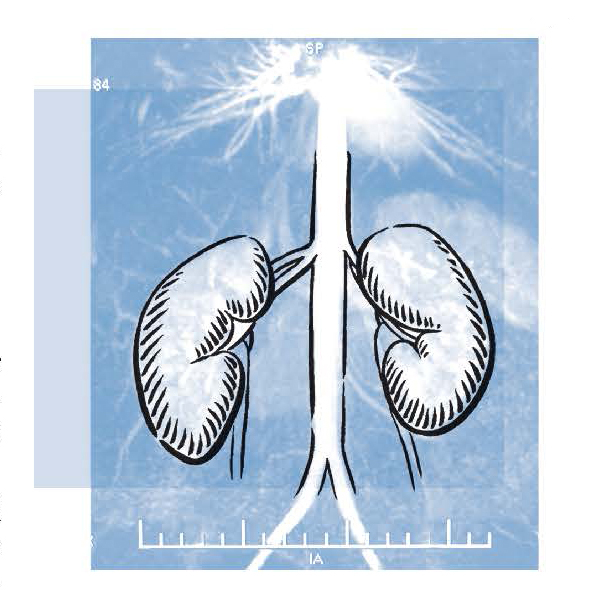 Urine protein or microalbumin test assesses for early signs of kidney damage. Doctors should order specialty consultations to assess for complications in the eyes and feet. Prisoners with type 2 diabetes often have trouble getting regular blood sugar tests. There is often more concern by health staff for those on insulin who are seen every day for shots. During lockdown, the usual routines are disrupted. Very limited meals such as cold cereal and milk or cheese sandwiches may be provided in cells. Plus, it might be difficult to get medicine and go to sick call. If you are prepared, you have confidence. It feels good if you don’t have to ask anyone for things you need. During lockdown, the trip to medical for injections could occur anytime. Insulin may be given at different times every day and not be coordinated with meals at all. Be aware that there is a greater risk of bad low blood sugars when insulin is not coordinated with meals. During lockdown, you may not get as much food and meals may not be well-balanced. You will probably get enough carbohydrate from the meals they give you. But, you can’t trade with others to get more fruit and vegetables. You may need to provide your own snack and supplement with protein (canned tuna or mackerel) and fruit (canned fruit). If possible, stockpile carbohydrate and protein foods in the event you have lows during lockdowns. Some examples of carbohydrates are ramen noodles, rice, and crackers. Some examples of proteins are peanut butter, canned fish or seafood, nuts and beans. During lockdown, because usual daily activities are disrupted, you need to be active in the cell. 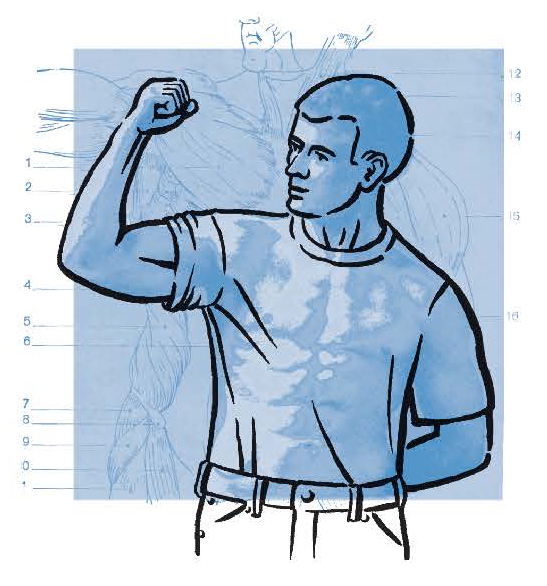 Learn to exercise all muscle groups alone in the cell with sit-ups, dips and pull-ups off the bed. If you can, stand up bed frame on end next to sink to make room to exercise. Successful diabetes management requires good self-care. But it also requires good health care from professionals familiar with diabetes. Be serious about your medical problems. If they see that you are concerned about your blood sugar and really serious about your health, they are more likely to do things for you. You have to be sincere. Stand out from the crowd as someone special, not someone who is always complaining or trying to con them. Don’t ever refuse to go to a medical appointment; if you later complain about medical care, they will point out your missed appointments. Information empowers you as a patient. Get as much information as you can about diabetes. Doctors and nurses may assume you are ignorant about your disease and dismiss you, unless you show them you know what is going on. Then they treat you differently. A passive convict is unlikely to get care because the medical programs are usually passive too, waiting for the prisoner to ask for care. Find out if tests are abnormal, what do they mean? Ask the doctor what changes in therapy he/she is recommending and what you should do to improve your diabetes management. Together, passive patients and passive health staff equals inadequate care. Advocate for yourself and learn how to present yourself to health staff effectively. Think about what your health issues are and practice describing them. Learn to take advantage of the services that are available. Don’t be afraid to ask questions about your symptoms: why is this happening? You have to ask for what you need. If you don’t stand up for yourself, they will keep putting you off. 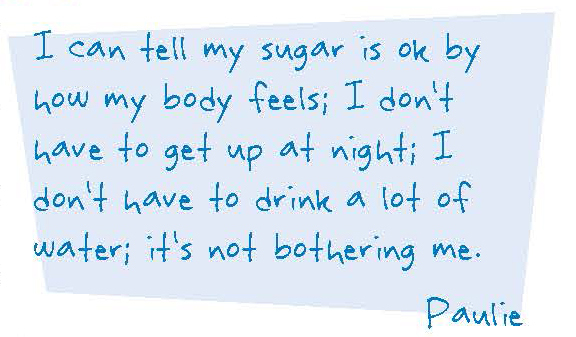 What is bothering you the most about your diabetes today? Don’t give up. Go up the chain of command to take your needs to the people who have the authority to address the problem. Use the grievance system. Go to sick call and request medical care. Wait 2 weeks for the medical call out. If it doesn’t come, go back to sick call and ask again. Wait some more. If you are still not seen, write to the warden or whoever is the right person in your prison to request necessary medical attention. The indignity of it all: up early, miss meals, chained up all day, traveling and waiting for hours for just a “3 minute” consult. Then it takes days for your wrists to stop hurting from the handcuffs. Go to the bathroom before you leave and dress warmly and wear clean clothes. Try to bring your own snack, a candy bar, stick of gum, glucose tablets, anything, in case you miss a meal and have to support your blood sugar. Complicated diabetes—an endrocrinologist can evaluate difficult to control diabetes. To assess and treat long-term damage to other organs—eye, nerve, or kidney specialist would be seen. Maintenance procedures—a podiatrist cuts nails, or shaves corns and calluses on feet. Specialist referrals maybe for appointments at clinics on-site or to outside doctor offices. Approval for special or costly tests and procedures—specialist “gatekeepers” need to make determinations. Remember, the appointment is in response to your request for care or the doctor’s referral. If you refuse to go, they have an excuse to never give you another chance. Use your self-control and be patient throughout the process. Ask the consultant questions: What is the diagnosis? What treatment does he recommend? Get a copy of the consultant report and study it. Go to sick call after the consult and ask your facility doctor questions so you can understand the consultant’s report. Demand the treatment that was recommended by the specialist. There are day-to-day complications, called short-term or acute complications. There are complications that accumulate over years, called long-term or chronic complications. Good blood sugar control helps prevent both types of complications. Low blood sugar is the most common acute complication. Other acute complications are uncommon and likely to occur only when type 1 diabetics don’t get any insulin at all. Eye disease: Diabetic damage to the retina (retinopathy), the lens (cataract), and the optic nerve (glaucoma) can cause blurred vision, cloudy vision, halos or blindness. Kidney disease: Diabetic kidney disease first shows up as protein in the urine and can progress to kidney failure and dialysis. There are no early symptoms of kidney disease. Nerve damage: Diabetic nerve damage can effect sensory nerves (tingling, numbness, or pain); motor nerves (weakness); or autonomic nerves (dizziness, slow digestion). Diseases of arteries: Diabetics have more diseases caused by blocked arteries, such as heart attacks, strokes, and cramps in leg muscles occurring during activity. Foot problems: Diabetics have more foot problems, like sores and wounds that won’t heal, infections and amputations. “He got kidney failure because he didn’t take care of himself” is a common attitude. Punitive attitudes like that don’t help people do better. “He got kidney failure in spite of everything he could do,” is more supportive. Working together, we can all do better. Recognize low blood sugar when it happens to you. Often you can feel it. Recognize low blood sugar in others. You may see it before he or she feels it. Know how to help, especially when someone has a seizure from extreme low blood sugar. Carry glucose, crackers, or candy to use when you feel low. Be alert to the symptoms of low blood sugar so you can act to treat it early. Early: he’s feeling shaky, sweaty: feed him. Later: he’s confused, dull witted: convince him to eat candy or glucose tablets right away. 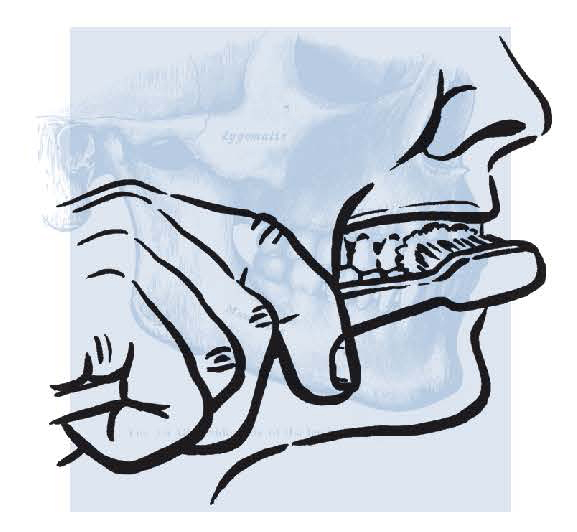 Severe: he’s out of his head: try glucose gel between the lips and gums if you have it; try sugar packet between lips and gums if that is all you have. Emergency: he’s seizing or unconscious: he needs an emergency glucagon shot from medical. Once he wakes up, he needs to eat a large snack with both protein and carbohydrate. Feet become vulnerable after you have had diabetes for a few years. Diabetic nerve damage causes numbness and injuries occur due to the lack of a pain warning system. Poor circulation causes slow healing and poor resistance to infection. A minor injury may become an infected sore. If infection spreads out of control, amputation may become necessary. Foot care is focused on preventing sores and infections from starting, and, finding sores early when they do occur so treatment can be started before the problem gets out of hand. Wash feet daily and inspect feet daily for sores, blisters, cuts, or tender spots. You need prompt treatment of foot sores and infections so get medical attention if you find any of those symptoms. The feet of people with diabetes should be examined by the doctor or nurse at every visit. 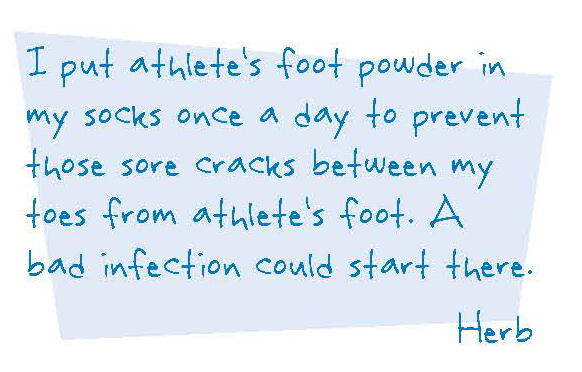 You can help make sure this happens by taking your shoes and socks off before the doctor comes in to see you. They should test sensation with a stiff plastic filament or tuning fork at least once a year. Try to get an experienced professional to cut your nails. Don’t cut nails too close because if feet are numb, you can’t feel the painful warning when cutting too close. An injured nail bed is a possible source of infection. Don’t try to shave them yourself. Get an experienced health professional, like a podiatrist, to shave them for you. Don’t wear shoes that don’t fit and never go barefoot. Empty shoes before putting them on. 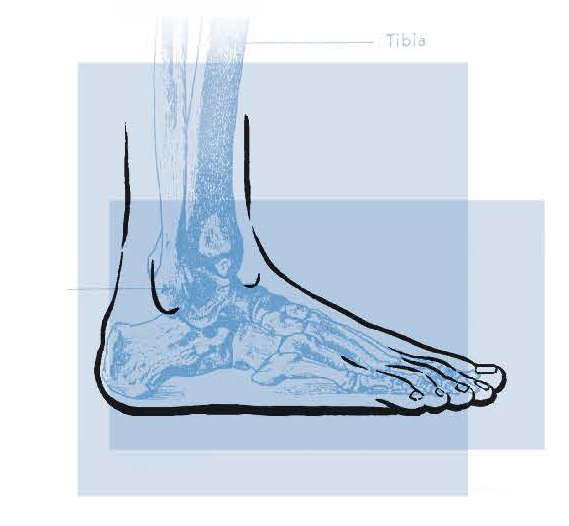 A pebble in the shoe can cause a terrible sore if you walk on it all day. This could easily happen when the feet are numb from diabetic nerve damage. Nerve damage reduces natural oils in the skin of the lower legs and feet. This causes dry, cracked skin that can result in infection. Foot fungus and toe fungus are often not paid attention to. But, there are lots of athlete’s foot and toenail fungus in prisons. Always wear closed toe sandals in showers and locker rooms because walking barefoot can expose you to fungus. Treatment of foot infections in diabetics can be difficult. Get professional help as soon as a blister or sore is found on your daily foot inspection. Management of serious infections often requires a lot of nursing care and attention: like dressing changes or soaks several times a day. It may require infirmary care or plastic surgery. It may be hard to get all the care you need, even in an infirmary, even when ordered by a consultant or facility physician. Don’t let it go. Do as much as you can for yourself, but try to get professional help as soon as you can. Foot ulcers heal better if you don’t walk on them. If you have a foot ulcer, you need to be off programs and resting off your feet as much as possible. 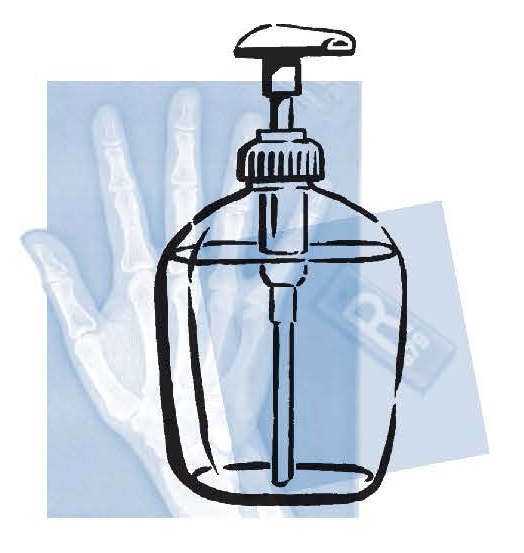 A health professional needs to remove dead skin or callus from the edges of the ulcer weekly. The ulcer has to be kept clean and dry with daily dressing changes. If you have an infection or a foot ulcer, it is even more important to keep your blood sugar as normal as possible. Diabetes is the most common cause of blindness in adults. Prevent eye complications with good blood sugar control. The lower the A-1-C the lower the risk of diabetic eye disease. Control eye damage with early diagnosis. Get an annual dilated eye exam by an eye specialist. 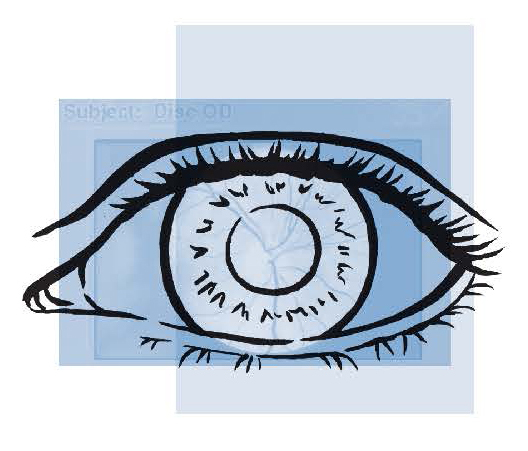 Three types of eye disease occur with diabetes: cataract; glaucoma; retinal disease. Cataract is a cloudy spot in the lens in the front of the eye and cataract causes blurred vision or halos around lights. Glaucoma is increased pressure in the front part of the eye. Eventually the pressure damages the optic nerve, causing blindness. Diabetic diseases of the retina begin with excess growth of blood vessels on the retina in the back of the eye. Bleeding and scarring eventually can cause detachment of the retina and blindness. Treat eye complications early, before serious damage has already occurred. Start treatment before you have any symptoms that would warn you. The only way to make an early diagnosis is to have a dilated eye exam by an eye professional every year. Medicated drops to treat glaucoma. Laser surgery to treat overgrowth of blood vessels on the retina. Cataract removal when vision is seriously affected. Dilated eye exams should be done annually by an eye specialist. Get specialist treatment before vision is noticeably damaged because damage may occur before you are aware of vision problems. Diabetes is the most common cause of kidney failure, dialysis and transplant. Know the risk and remember that good blood sugar control prevents kidney damage. The first evidence of kidney damage is when protein starts leaking into the urine. Eventually the damage gets so severe it causes kidney failure, dialysis and a transplant is needed. Treatment with medicine called “ACE Inhibitors” or “ARBs” slows the progress of diabetic kidney disease. Diabetic kidney disease gets worse much faster when you have both diabetes and hypertension. Remember that a low salt diet and medicine help control blood pressure. Diabetics need tighter control of their blood pressure than other people do because of the greater risk to the kidneys and blood vessels. Your blood pressure should be less than 130 for the top or first number and less than 80 for the bottom or second number. Diabetics are at greater risk for heart attack, stroke and other problems related to poor circulation like cramps in the legs. Control all risk factors including cholesterol, smoking, hypertension, blood sugar, and inactivity. Your lipid profile includes: Total cholesterol, LDL cholesterol, HDL cholesterol, Triglycerides. Improve lipid profile with a low saturated fat, low cholesterol diet. Add medicine (“statins”) if diet doesn’t get lipids into target ranges. Target total cholesterol is below 200. Target LDL-cholesterol is below 100. Eat less animal fat like butter, cream, poultry skin, fatty meats and sausage products. Eat less cholesterol, which is in foods like eggs and liver. Eat more fruits and vegetables, especially raw vegetables. Eat more high fiber foods like whole grains and oats. Get blood tests to measure the fats in the blood so you know if you have a problem. Take medicine to reduce fats in the blood if they are too high and cannot be controlled with diet and activity. The prison environment can become easily contaminated with infectious diseases due to overcrowding and poor hygiene. Lung infections more common in prison include influenza, bacterial pneumonia, and tuberculosis. Because tuberculosis is more common in prisons, get screened annually. Poor circulation, numbness and high sugar all contribute to foot infections. Don’t use needles for tattooing or shooting up because contaminated needles in prison are more likely to transmit HIV, hepatitis C and hepatitis B.
Wash hands frequently and always wash hands when you come back to your cell before you touch anything. Floors, especially in showers, are contaminated with foot fungus. So never go barefoot and always wear closed toe sandals in the shower. Influenza is common in winter. Get the flu vaccine when it is offered. Diabetics are more prone to bacterial pneumonia. Get the pneumovax vaccine when it is offered. Prisoners are more likely to be exposed to hepatitis A and B. Get the hepatitis A vaccine and the hepatitis B vaccine series of three shots if they are offered. Diabetics are at greater risk for gum disease and need meticulous oral hygiene and more frequent cleanings. If you can’t get dental hygienist care? Do better self-care. Make sure to do prolonged brushing twice a day and if available, use an electric toothbrush, floss regularly twice a day, and use an antiseptic mouthwash. Sensory nerves: Causes pain, numbness or tingling. Autonomic nerves: Causes dizziness right after standing up, stom - ach fullness for hours after meals, inability to have an erection. 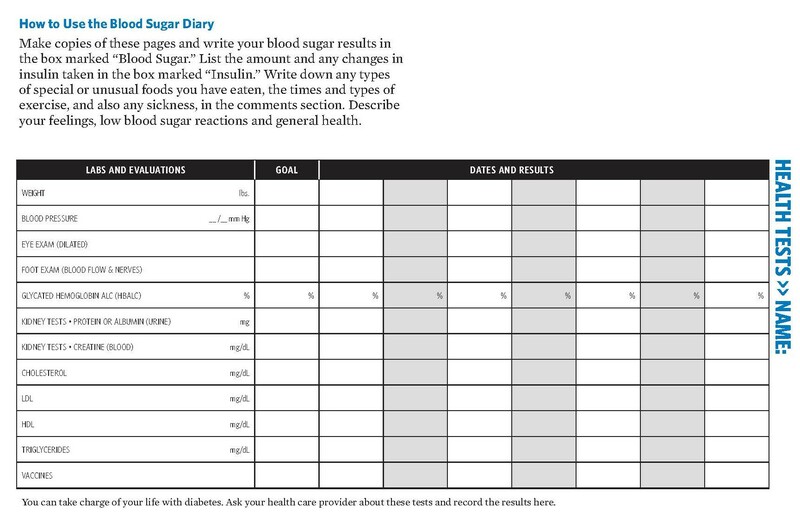 Make copies of these pages and write your blood sugar results in the box marked “Blood Sugar.” List the amount and any changes in insulin taken in the box marked “Insulin.” Write down any types of special or unusual foods you have eaten, the times and types of exercise, and also any sickness, in the comments section. Describe your feelings, low blood sugar reactions and general health. There are four things you must prove in order to win a medical care claim: (1) a serious medical need; (2) the prison official’s actual knowledge of your serious medical need; (3) that prison official’s failure to reasonably respond by providing you adequate treatment (this is called “deliberate indifference”); and (4) that the official’s “deliberate indifference” caused you an injury or is likely to injure you in the future. If you become sick or injured, you need to do everything you can to tell officials about your problem, such as filing written grievances. You have no right to medical treatment if no one knows about your problem. Once officials know about your serious medical need, they must respond reasonably. What kind of response does the Constitution require? Ideally, you should be promptly examined by qualified medical personnel, prescribed or ordered the necessary treatment, given that treatment properly, and then provided follow-up attention as needed. As you know, however, life in jail or prison is sometimes far from ideal. According to the Supreme Court, officials only violate the Constitution when they intentionally deny or delay access to medical care, provide grossly inadequate treatment, or intentionally interfere with prescribed treatment. Finally, to win a medical care claim, you must show that the officials’ deliberate indifference caused you, or is likely to cause you, an injury or serious medical harm, such as blindness, amputation, or kidney failure. 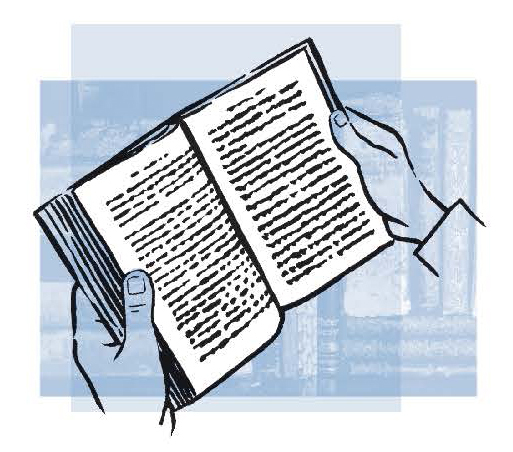 Be sure to include your name, prison identification number, mailing address, and any other necessary information for getting the book to you. This handbook is a summary of the ideas and experiences discussed during the approximately ten years of regular meetings of the diabetes support group at Great Meadow Correctional Facility in Comstock, NY. Many people contributed to this handbook. The most important contributors are the past and present group participants. Prisoners at Great Meadow joined the group for various reasons. Some had diabetes themselves and wanted to learn more about how to take care of themselves. 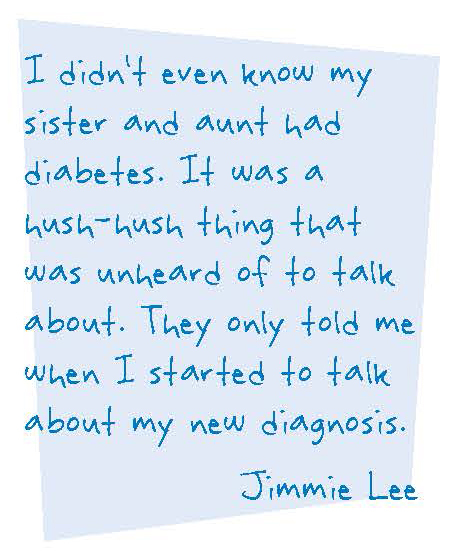 Others had family members with diabetes and wanted to understand more about their family members’ health needs. Through their willingness to share their stories, concerns, and lessons learned, they taught us a lot about how to live with diabetes in very difficult circumstances. To write the handbook, we started with notes taken by Michael Cohen during the group sessions, sorted the ideas by subject, and ordered them logically for presentation. Then, each section of the handbook was reviewed, discussed and improved in the diabetes support group. We are also deeply grateful to Rhonda Brownstein and Rosi Smith of the Southern Poverty Law Center, who not only wrote the section on legal rights, but responded with immediate enthusiasm and support for publishing the handbook. At any given time, over 2 million people are incarcerated in prisons and jails in the U.S. (1). It is estimated that nearly 80,000 of these inmates have diabetes, a prevalence of 4.8% (2). In addition, many more people pass through the corrections system in a given year. In 1998 alone, over 11 million people were released from prison to the community (1). The current estimated prevalence of diabetes in correctional institutions is somewhat lower than the overall U.S. prevalence of diabetes, perhaps because the incarcerated population is younger than the general population. The prevalence of diabetes and its related comorbidities and complications, however, will continue to increase in the prison population as current sentencing guidelines continue to increase the number of aging prisoners and the incidence of diabetes in young people continues to increase. People with diabetes in correctional facilities should receive care that meets national standards. Correctional institutions have unique circumstances that need to be considered so that all standards of care may be achieved (3). Correctional institutions should have written policies and procedures for the management of diabetes and for training of medical and correctional staff in diabetes care practices. These policies must take into consideration issues such as security needs, transfer from one facility to another, and access to medical personnel and equipment, so that all appropriate levels of care are provided. Ideally, these policies should encourage or at least allow patients to self-manage their diabetes. Ultimately, diabetes management is dependent upon having access to needed medical personnel and equipment. Ongoing diabetes therapy is important in order to reduce the risk of later complications, including cardiovascular events, visual loss, renal failure, and amputation. Early identification and intervention for people with diabetes is also likely to reduce short-term risks for acute complications requiring transfer out of the facility, thus improving security. This document provides a general set of guidelines for diabetes care in correctional institutions. It is not designed to be a diabetes management manual. More detailed information on the management of diabetes and related disorders can be found in the American Diabetes Association (ADA) Clinical Practice Recommendations, published each year in January as the first supplement to Diabetes Care, as well as the “Standards of Medical Care in Diabetes” (4) contained therein. This discussion will focus on those areas where the care of people with diabetes in correctional facilities may differ, and specific recommendations are made at the end of each section. Reception screening should emphasize patient safety. In particular, rapid identification of all insulin-treated persons with diabetes is essential in order to identify those at highest risk for hypo-and hyperglycemia and diabetic ketoacidosis (DKA). All insulin-treated patients should have a capillary blood glucose (CBG) determination within 1–2 h of arrival. Signs and symptoms of hypo- or hyperglycemia can often be confused with intoxication or withdrawal from drugs or alcohol. Individuals with diabetes exhibiting signs and symptoms consistent with hypoglycemia, particularly altered mental status, agitation, combativeness, and diaphoresis, should have finger-stick blood glucose levels measured immediately. Patients with a diagnosis of diabetes should have a complete medical history and physical examination by a licensed health care provider with prescriptive authority in a timely manner. If one is not available on site, one should be consulted by those performing reception screening. The purposes of this history and physical examination are to determine the type of diabetes, current therapy, alcohol use, and behavioral health issues, as well as to screen for the presence of diabetes-related complications. The evaluation should review the previous treatment and the past history of both glycemic control and diabetes complications. It is essential that medication and medical nutrition therapy (MNT) be continued without interruption upon entry into the correctional system, as hiatus in either medication or appropriate nutrition may lead to either severe hypo- or hyperglycemia that can rapidly progress to irreversible complications, even death. All potential elements of the initial medical evaluation are included in Table 5 of the ADA’s “Standards of Medical Care in Diabetes,” referred to hereafter as the “Standards of Care” (4). The essential components of the initial history and physical examination are detailed in Fig. 1. Referrals should be made immediately if the patient with diabetes is pregnant. Consistent with the ADA Standards of Care, patients should be evaluated for diabetes risk factors at the intake physical and at appropriate times thereafter. Those who are at high risk should be considered for blood glucose screening. If pregnant, a risk assessment for gestational diabetes mellitus (GDM) should be undertaken at the first prenatal visit. Patients with clinical characteristics consistent with a high risk for GDM should undergo glucose testing as soon as possible. High-risk women not found to have GDM at the initial screening and average-risk women should be tested between 24 and 28 weeks of gestation. For more detailed information on screening for both type 2 and gestational diabetes, see the ADA Position Statement “Screening for Type 2 Diabetes” (5) and the Standards of Care (4). Glycemic control is fundamental to the management of diabetes. 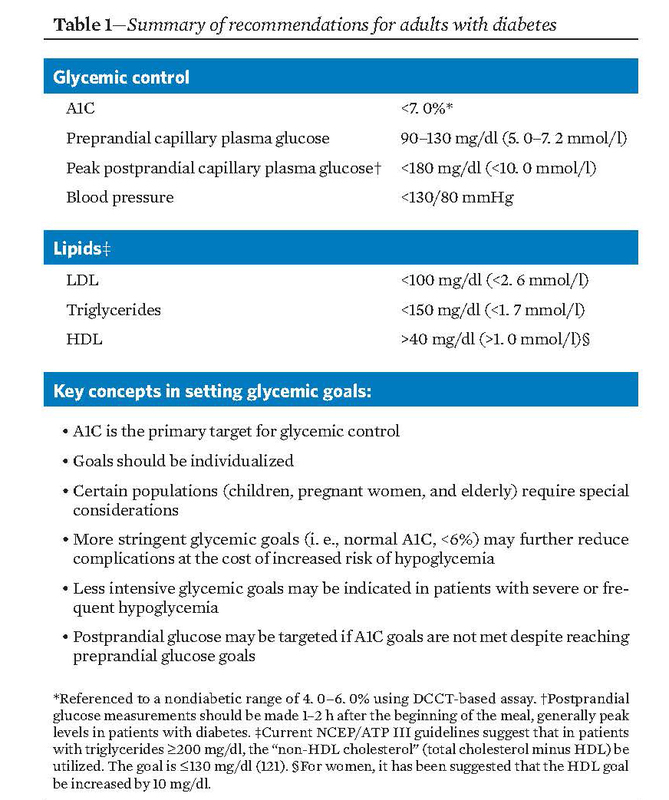 A management plan to achieve normal or near-normal glycemia with an A1C goal of <7% should be developed for diabetes management at the time of initial medical evaluation. Goals should be individualized (4), and less stringent treatment goals may be appropriate for patients with a history of severe hypoglycemia, patients with limited life expectancies, elderly adults, and individuals with comorbid conditions (4). This plan should be documented in the patient’s record and communicated to all persons involved in his/her care, including security staff. Table 1, taken from the ADA Standards of Care, provides a summary of recommendations for setting glycemic control goals for adults with diabetes. People with diabetes should ideally receive medical care from a physician-coordinated team. Such teams include, but are not limited to, physicians, nurses, dietitians, and mental health professionals with expertise and special interest in diabetes. It is essential in this collaborative and integrated team approach that individuals with diabetes assume as active a role in their care as possible. Diabetes self-management education is an integral component of care. Patient self-management should be emphasized, and the plan should encourage the involvement of the patient in problem solving as much as possible. It is helpful to house insulin-treated patients in a common unit, if this is possible, safe, and consistent with providing access to other programs at the correctional institution. Common housing not only can facilitate mealtimes and medication administration, but also potentially provides an opportunity for diabetes self-management education to be reinforced by fellow patients. Nutrition counseling and menu planning are an integral part of the multidisciplinary approach to diabetes management in correctional facilities. A combination of education, interdisciplinary communication, and monitoring food intake aids patients in understanding their medical nutritional needs and can facilitate diabetes control during and after incarceration. Nutrition counseling for patients with diabetes is considered an essential component of diabetes self-management. People with diabetes should receive individualized MNT as needed to achieve treatment goals, preferably provided by a registered dietitian familiar with the components of MNT for persons with diabetes. Educating the patient, individually or in a group setting, about how carbohydrates and food choices directly affect diabetes control is the first step in facilitating self-management. This education enables the patient to identify better food selections from those available in the dining hall and commissary. 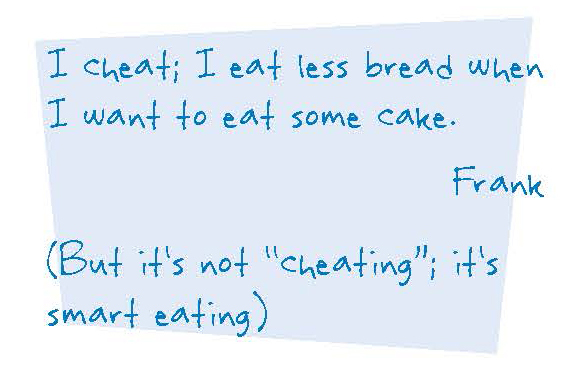 Such an approach is more realistic in a facility where the patient has the opportunity to make food choices. The easiest and most cost-effective means to facilitate good outcomes in patients with diabetes is instituting a heart-healthy diet as the master menu (6). There should be consistent carbohydrate content at each meal, as well as a means to identify the carbohydrate content of each food selection. Providing carbohydrate content of food selections and/or providing education in assessing carbohydrate content enables patients to meet the requirements of their individual MNT goals. Commissaries should also help in dietary management by offering healthy choices and listing the carbohydrate content of foods. The use of insulin or oral medications may necessitate snacks in order to avoid hypoglycemia. These snacks are a part of such patients’ medical treatment plans and should be prescribed by medical staff. Timing of meals and snacks must be coordinated with medication administration as needed to minimize the risk of hypoglycemia, as discussed more fully in the MEDICATION section of this document. For further information, see the ADA Position Statement “Nutrition Principles and Recommendations in Diabetes” (7). All patients must have access to prompt treatment of hypo- and hyperglycemia. Correctional staff should be trained in the recognition and treatment of hypo- and hyperglycemia, and appropriate staff should be trained to administer glucagon. After such emergency care, patients should be referred for appropriate medical care to minimize risk of future decompensation. Institutions should implement a policy requiring staff to notify a physician of all CBG results outside of a specified range, as determined by the treating physician (e.g., <50 or >350 mg/dl). Severe hyperglycemia in a person with diabetes may be the result of intercurrent illness, missed or inadequate medication, or corticosteroid therapy. Correctional institutions should have systems in place to identify and refer to medical staff all patients with consistently elevated blood glucose as well as intercurrent illness. The stress of illness in those with type 1 diabetes frequently aggravates glycemic control and necessitates more frequent monitoring of blood glucose (e.g., every 4–6 h). Marked hyperglycemia requires temporary adjustment of the treatment program and, if accompanied by ketosis, interaction with the diabetes care team. Adequate fluid and caloric intake must be ensured. Nausea or vomiting accompanied with hyperglycemia may indicate DKA, a life-threatening condition that requires immediate medical care to prevent complications and death. Correctional institutions should identify patients with type 1 diabetes who are at risk for DKA, particularly those with a prior history of frequent episodes of DKA. For further information see “Hyperglycemic Crisis in Diabetes” (8). Hypoglycemia is defined as a blood glucose level <60 mg/dl. Severe hypoglycemia is a medical emergency defined as hypoglycemia requiring assistance of third party and is often associated with mental status changes that may include confusion, incoherence, combativeness, somnolence, lethargy, seizures, or coma. Signs and symptoms of severe hypoglycemia can be confused with intoxication or withdrawal. Individuals with diabetes exhibiting signs and symptoms consistent with hypoglycemia, particularly altered mental status, agitation, and diaphoresis, should have their CBG levels checked immediately. Security staff who supervise patients at risk for hypoglycemia (i.e., those on insulin or oral hypoglycemic agents) should be educated in the emergency response protocol for recognition and treatment of hypoglycemia. Every attempt should be made to document CBG before treatment. Patients must have immediate access to glucose tablets or other glucose-containing foods. Hypoglycemia can generally be treated by the patient with oral carbohydrates. If the patient cannot be relied on to keep hypoglycemia treatment on his/her person, staff members should have ready access to glucose tablets or equivalent. In general, 15–20 g oral glucose will be adequate to treat hypoglycemic events. CBG and treatment should be repeated at 15-min intervals until blood glucose levels return to normal (><60 mg/dl. Severe hypoglycemia is a medical emergency defined as hypoglycemia requiring assistance of third party and is often associated with mental status changes that may include confusion, incoherence, combativeness, somnolence, lethargy, seizures, or coma. Signs and symptoms of severe hypoglycemia can be confused with intoxication or withdrawal. Individuals with diabetes exhibiting signs and symptoms consistent with hypoglycemia particularly altered mental status, agitation, and diaphoresis, should have their CBG levels checked immediately. Security staffs who supervise patients at risk for hypoglycemia (i.e., those on insulin or oral hypoglycemic agents) should be educated in the emergency response protocol for recognition and treatment of hypoglycemia. Every attempt should be made to document CBG before treatment. Patients must have immediate access to glucose tablets or other glucose-containing foods. Hypoglycemia can generally be treated by the patient with oral carbohydrates. If the patient cannot be relied on to keep hypoglycemia treatment on his/her person, staff members should have ready access to glucose tablets or equivalent. In general, 15–20 g oral glucose will be adequate to treat hypoglycemic events. CBG and treatment should be repeated at 15-min intervals until blood glucose levels return to normal (>70 mg/dl). Staff should have glucagon for intramuscular injection or glucose for intravenous infusion available to treat severe hypoglycemia without requiring transport of the hypoglycemic patient to an outside facility. Any episode of severe hypoglycemia or recurrent episodes of mild to moderate hypoglycemia require reevaluation of the diabetes management plan by the medical staff. In certain cases of unexplained or recurrent severe hypoglycemia, it may be appropriate to admit the patient to the medical unit for observation and stabilization of diabetes management. Correctional institutions should have systems in place to identify the patients at greater risk for hypoglycemia (i.e., those on insulin or sulfonylurea therapy) and to ensure the early detection and treatment of hypoglycemia. If possible, patients at greater risk of severe hypoglycemia (e.g., those with prior episode of severe hypoglycemia) may be housed in units closer to the medical unit in order to minimize delay in treatment. Formularies should provide access to usual and customary oral medications and insulins necessary to treat diabetes and related conditions. While not every brand name of insulin and oral medication needs to be available, individual patient care requires access to short-, medium-, and long-acting insulins and the various classes of oral medications (e.g., insulin secretagogues, biguanides, a-glucosidase inhibitors, and thiazolidinediones) necessary for current diabetes management. Patients at all levels of custody should have access to medication at dosing frequencies that are consistent with their treatment plan and medical direction. If feasible and consistent with security concerns, patients on multiple doses of short-acting oral medications should be placed in a “keep on person” program. In other situations, patients should be permitted to self-inject insulin when consistent with security needs. Medical department nurses should determine whether patients have the necessary skill and responsible behavior to be allowed self-administration and the degree of supervision necessary. When needed, this skill should be a part of patient education. Reasonable syringe control systems should be established. In the past, the recommendation that regular insulin be injected 30–45 min before meals presented a significant problem when “lock downs” or other disruptions to the normal schedule of meals and medications occurred. The use of multiple-dose insulin regimens using rapid-acting analogs can decrease the disruption caused by such changes in schedule. Correctional institutions should have systems in place to ensure that rapid-acting insulin analogs and oral agents are given immediately before meals if this is part of the patient’s medical plan. It should be noted however that even modest delays in meal consumption with these agents can be associated with hypoglycemia. If consistent access to food within 10 min cannot be ensured, rapid-acting insulin analogs and oral agents are approved for administration during or immediately after meals. Should circumstances arise that delay patient access to regular meals following medication administration, policies and procedures must be implemented to ensure the patient receives appropriate nutrition to prevent hypoglycemia. Both continuous subcutaneous insulin infusion and multiple daily insulin injection therapy (consisting of three or more injections a day) can be effective means of implementing intensive diabetes management with the goal of achieving near-normal levels of blood glucose (9). While the use of these modalities may be difficult in correctional institutions, every effort should be made to continue multiple daily insulin injection or continuous subcutaneous insulin infusion in people who were using this therapy before incarceration or to institute these therapies as indicated in order to achieve blood glucose targets. It is essential that transport of patients from jails or prisons to off-site appointments, such as medical visits or court appearances, does not cause significant disruption in medication or meal timing. Correctional institutions and police lockups should implement policies and procedures to diminish the risk of hypo-and hyperglycemia by, for example, providing carry-along meals and medication for patients traveling to off-site appointments or changing the insulin regimen for that day. The availability of prefilled insulin “pens” provides an alternative for off-site insulin delivery. 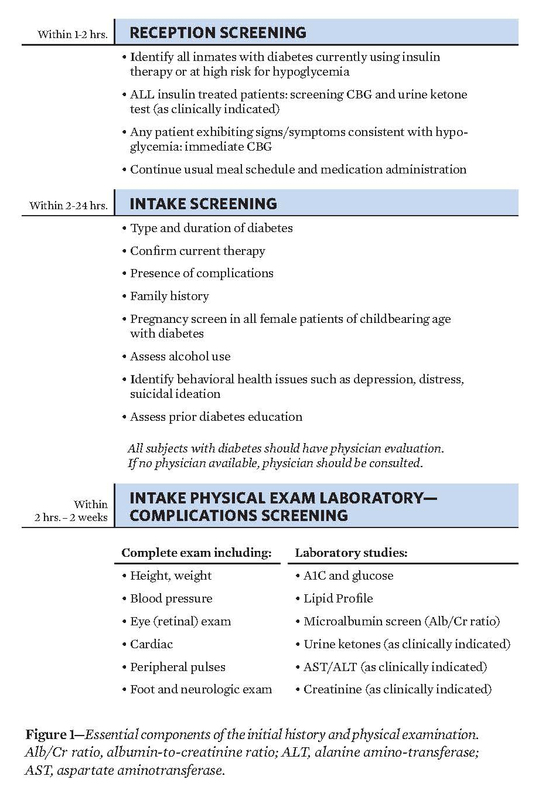 All patients with a diagnosis of diabetes should receive routine screening for diabetes-related complications, as detailed in the ADA Standards of Care (4). Interval chronic disease clinics for persons with diabetes provide an efficient mechanism to monitor patients for complications of diabetes. In this way, appropriate referrals to consultant specialists, such as optometrists/ophthalmologists, nephrologists, and cardiologists, can be made on an as-needed basis and interval laboratory testing can be done. The following complications should be considered. • Foot care: Recommendations for foot care for patients with diabetes and no history of an open foot lesion are described in the ADA Standards of Care. A comprehensive foot examination is recommended annually for all patients with diabetes to identify risk factors predictive of ulcers and amputations. Persons with an insensate foot, an open foot lesion, or a history of such a lesion should be referred for evaluation by an appropriate licensed health professional (e.g., podiatrist or vascular surgeon). Special shoes should be provided as recommended by licensed health professionals to aid healing of foot lesions and to prevent development of new lesions. • Retinopathy: Annual retinal examinations by a licensed eye care professional should be performed for all patients with diabetes, as recommended in the ADA Standards of Care. Visual changes that cannot be accounted for by acute changes in glycemic control require prompt evaluation by an eye care professional. • Cardiac: People with type 2 diabetes are at a particularly high risk of coronary artery disease. Cardiovascular disease risk factor management is of demonstrated benefit in reducing this complication in patients with diabetes. Blood pressure should be measured at every routine diabetes visit. In adult patients, test for lipid disorders at least annually and as needed to achieve goals with treatment. Use aspirin therapy (75–162 mg/day) in all adult patients with diabetes and cardiovascular risk factors or known macrovascular disease. Current national standards for adults with diabetes call for treatment of lipids to goals of LDL <_100, HDL >40, triglycerides <150 mg/dl and blood pressure to level of <130/80 mmHg. Monitoring of CBG is a strategy that allows caregivers and people with diabetes to evaluate diabetes management regimens. The frequency of monitoring will vary by patients’ glycemic control and diabetes regimens. Patients with type 1 diabetes are at risk for hypoglycemia and should have their CBG monitored three or more times daily. Patients with type 2 diabetes on insulin need to monitor at least once daily and more frequently based on their medical plan. Patients treated with oral agents should have CBG monitored with sufficient frequency to facilitate the goals of glycemic control, assuming that there is a program for medical review of these data on an ongoing basis to drive changes in medications. Patients whose diabetes is poorly controlled or whose therapy is changing should have more frequent monitoring. Unexplained hyperglycemia in a patient with type 1 diabetes may suggest impending DKA, and monitoring of ketones should therefore be performed. Glycated hemoglobin (A1C) is a measure of long-term (2- to 3-month) glycemic control. Perform the A1C test at least two times a year in patients who are meeting treatment goals (and who have stable glycemic control) and quarterly in patients whose therapy has changed or who are not meeting glycemic goals. Discrepancies between CBG monitoring results and A1C may indicate a hemoglobinopathy, hemolysis, or need for evaluation of CBG monitoring technique and equipment or initiation of more frequent CBG monitoring to identify when glycemic excursions are occurring and which facet of the diabetes regimen is changing. In the correctional setting, policies and procedures need to be developed and implemented regarding CBG monitoring that address the following. 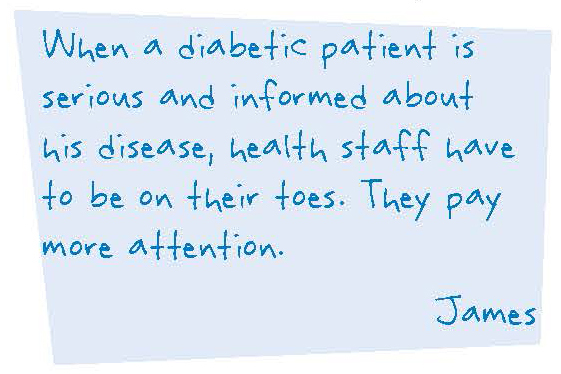 Self-management education is the cornerstone of treatment for all people with diabetes. The health staff must advocate for patients to participate in self-management as much as possible. Individuals with diabetes who learn self-management skills and make lifestyle changes can more effectively manage their diabetes and avoid or delay complications associated with diabetes. In the development of diabetes self-management education program in the correctional environment, the unique circumstances of the patient should be considered while still providing, to the greatest extent possible, the elements of the “National Standards for Diabetes Self-Management Education” (11). A staged approach may be used depending on the needs assessment and the length of incarceration. 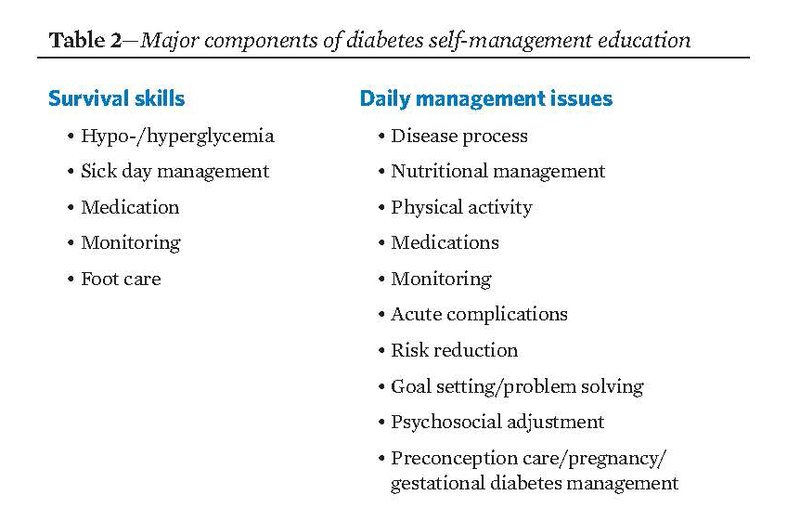 Table 2 sets out the major components of diabetes self-management education. Survival skills should be addressed as soon as possible; other aspects of education may be provided as part of an ongoing education program. Ideally, self-management education is coordinated by a certified diabetes educator who works with the facility to develop policies, procedures, and protocols to ensure that nationally recognized education guidelines are implemented. The educator is also able to identify patients who need diabetes self-management education, including an assessment of the patients’ medical, social, and diabetes histories; diabetes knowledge, skills, and behaviors; and readiness to change. Policies and procedures should be implemented to ensure that the health care staff has adequate knowledge and skills to direct the management and education of persons with diabetes. The health care staff needs to be involved in the development of the correctional officers’ training program. The staff education program should be at a lay level. Training should be offered at least biannually, and the curriculum should cover the following. Patients with diabetes who are withdrawing from drugs and alcohol need special consideration. This issue particularly affects initial police custody and jails. At an intake facility, proper initial identification and assessment of these patients are critical. The presence of diabetes may complicate detoxification. Patients in need of complicated detoxification should be referred to a facility equipped to deal with high-risk detoxification. Patients with diabetes should be educated in the risks involved with smoking. All inmates should be advised not to smoke. 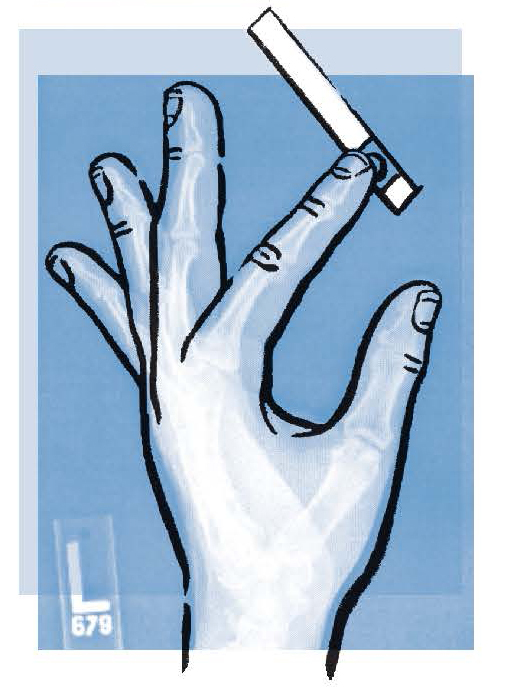 Assistance in smoking cessation should be provided as practical. Patients in jails may be housed for a short period of time before being transferred or released, and it is not unusual for patients in prison to be transferred within the system several times during their incarceration. One of the many challenges that health care providers face working in the correctional system is how to best collect and communicate important health care information in a timely manner when a patient is in initial police custody, is jailed short term, or is transferred from facility to facility. The importance of this communication becomes critical when the patient has a chronic illness such as diabetes. Transferring a patient with diabetes from one correctional facility to another requires a coordinated effort. To facilitate a thorough review of medical information and completion of a transfer summary, it is critical for custody personnel to provide medical staff with sufficient notice before movement of the patient. Before the transfer, the health care staff should review the patient’s medical record and complete a medical transfer summary that includes the patient’s current health care issues. At a minimum, the summary should include the following. The medical transfer summary, which acts as a quick medical reference for the receiving facility, should be transferred along with the patient. To supplement the flow of information and to increase the probability that medications are correctly identified at the receiving institution, sending institutions are encouraged to provide each patient with a medication card to be carried by the patient that contains information concerning diagnoses, medication names, dosages, and frequency. Diabetes supplies, including diabetes medication, should accompany the patient. The sending facility must be mindful of the transfer time in order to provide the patient with medication and food if needed. The transfer summary or medical record should be reviewed by a health care provider upon arrival at the receiving institution. Planning for patients’ discharge from prisons should include instruction in the long-term complications of diabetes, the necessary lifestyle changes and examinations required to prevent these complications, and, if possible, where patients may obtain regular follow-up medical care. A quarterly meeting to educate patients with upcoming discharges about community resources can be valuable. Inviting community agencies to speak at these meetings and/or provide written materials can help strengthen the community link for patients discharging from correctional facilities. Discharge planning for the patients with diabetes should begin 1 month before discharge. During this time, application for appropriate entitlements should be initiated. Any gaps in the patient’s knowledge of diabetes care need to be identified and addressed. It is helpful if the patient is given a directory or list of community resources and if an appointment for follow-up care with a community provider is made. A supply of medication adequate to last until the first post release medical appointment should be provided to the patient upon release. The patient should be provided with a written summary of his/her current heath care issues, including medications and doses, recent A1C values, etc. Practical considerations may prohibit obtaining medical records from providers who treated the patient before arrest. Intake facilities should implement policies that 1) define the circumstances under which prior medical records are obtained (e.g., for patients who have an extensive history of treatment for complications); 2) identify person(s) responsible for contacting the prior provider; and 3) establish procedures for tracking requests. Facilities that use outside medical providers should implement policies and procedures for ensuring that key information (e.g., test results, diagnoses, physicians’ orders, appointment dates) is received from the provider and incorporated into the patient’s medical chart after each outside appointment. The procedure should include, at a minimum, a means to highlight when key information has not been received and designation of a person responsible for contacting the outside provider for this information. All medical charts should contain CBG test results in a specified, readily accessible section and should be reviewed on a regular basis. Children and adolescents with diabetes present special problems in disease management, even outside the setting of a correctional institution. Children and adolescents with diabetes should have initial and follow-up care with physicians who are experienced in their care. Confinement increases the difficulty in managing diabetes in children and adolescents, as it does in adults with diabetes. Correctional authorities also have different legal obligations for children and adolescents. Growing children and adolescents have greater caloric/nutritional needs than adults. The provision of an adequate amount of calories and nutrients for adolescents is critical to maintaining good nutritional status. 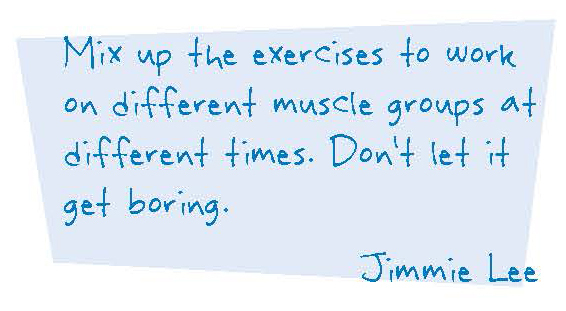 Physical activity should be provided at the same time each day. If increased physical activity occurs, additional CBG monitoring is necessary and additional carbohydrate snacks may be required. Children and adolescents who are incarcerated for extended periods should have follow-up visits at least every 3 months with individuals who are experienced in the care of children and adolescents with diabetes. Thyroid function tests and fasting lipid and microalbumin measurements should be performed according to recognized standards for children and adolescents (12) in order to monitor for autoimmune thyroid disease and complications and comorbidities of diabetes. Children and adolescents with diabetes exhibiting unusual behavior should have their CBG checked at that time. Because children and adolescents are reported to have higher rates of nocturnal hypoglycemia (13), consideration should be given regarding the use of episodic overnight blood glucose monitoring in these patients. In particular, this should be considered in children and adolescents who have recently had their overnight insulin dose changed. Pregnancy in a woman with diabetes is by definition a high-risk pregnancy. Every effort should be made to ensure that treatment of the pregnant woman with diabetes meets accepted standards (14,15). It should be noted that glycemic standards are more stringent, the details of dietary management are more complex and exacting, insulin is the only antidiabetic agent approved for use in pregnancy, and a number of medications used in the management of diabetic comorbidities are known to be teratogenic and must be discontinued in the setting of pregnancy. People with diabetes should receive care that meets national standards. Being incarcerated does not change these standards. Patients must have access to medication and nutrition needed to manage their disease. In patients who do not meet treatment targets, medical and behavioral plans should be adjusted by health care professionals in collaboration with the prison staff. It is critical for correctional institutions to identify particularly high-risk patients in need of more intensive evaluation and therapy, including pregnant women, patients with advanced complications, a history of repeated severe hypoglycemia, or recurrent DKA. A comprehensive, multidisciplinary approach to the care of people with diabetes can be an effective mechanism to improve overall health and delay or prevent the acute and chronic complications of this disease.